Students must be healthy to learn... but they also need to learn to be healthy. Proper nutrition in the school age years can reinforce lifelong eating habits that can contribute to a student's overall well being. This will help them to grow and learn to their fullest potential... and then go on to lead a long healthy life. 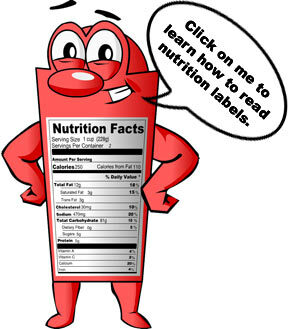 Click on the "Label Guy" icon and download a complete lesson from the USDA on how to read a Nutrition Label, includes fun animations and interactive quiz questions.